The Income Report is a dynamic, filterable real-time view of all un-billed and due amounts for current Matters in HoudiniEsq. This report is designed to help you stay on top of your billable time quickly and easily. It can be accessed by clicking Reports from the Main Menu and then selecting the “Income” option from the top bar as shown below. Two reports are currently available. The default view of the Income Report, the Firm Report, displays totals for each Staff according to their Role, and can be selected at any time by clicking the Default button. The columns shown display Staff, Un-billed amount, total Due amount (within the last 30 days) and then Due amounts which are past a specific number of days (30, 60 and 90 days in order). You can change the selected role at the top of the list. This will show billing totals for Matters sorted by Staff assigned as that specific role, such as Assistant. The “Rain Maker” report will specifically show un-billed time and total time invoiced. 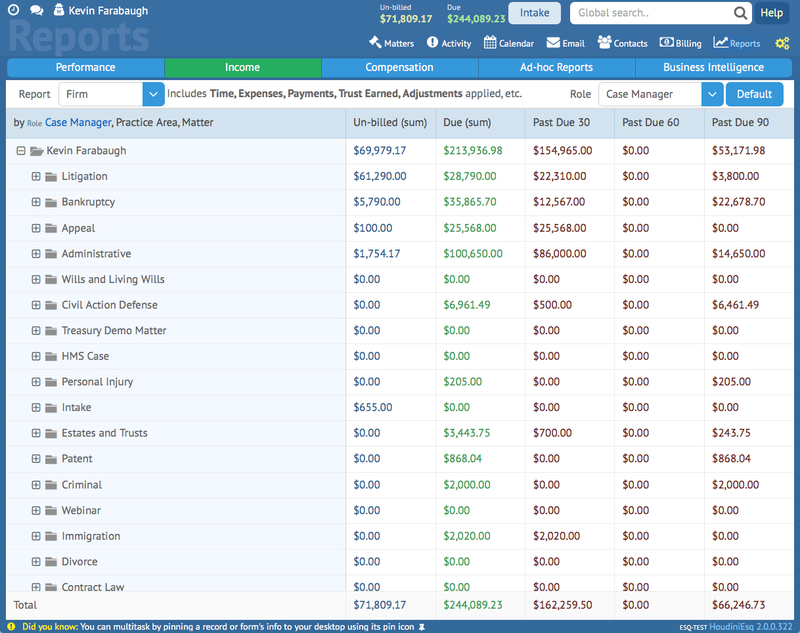 It excludes Expenses, Payments, Trust Earned and Adjustments, allowing you to focus on which attorney is creating the most billable time. This report does not take the Role of your staff into account, and thus does not have the Role filter. Each report can be sorted by each of these columns primarily by clicking any of the column headers. Clicking the + icon next to each of the Staff allows you to expand the list, displaying breakdowns of the totals by Matter type. You can further expand these Types to show Subtype summaries as well. The bottom row will always display totals for all columns for the current view. © Copyright LogicBit Software Corp.